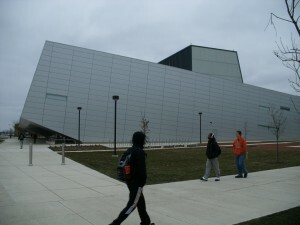 This is Wolfe Center for the Arts at BGSU. Photo taken by Phil Martin. 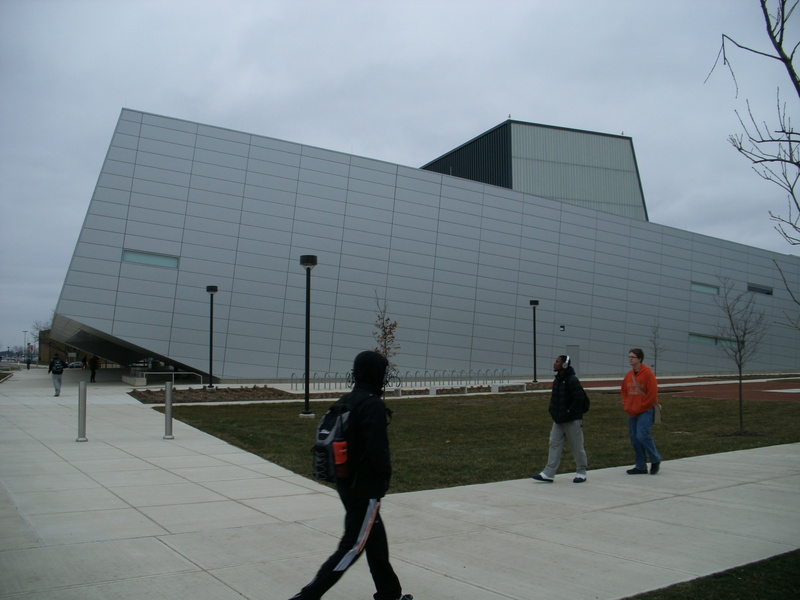 An unusually-shaped building draws attention as a new addition to BGSU. The 93,000-square-foot Wolfe Center for the Arts opened its doors on Dec. 9 as the new home for the Department of Theatre and Film. It also holds spaces for students and faculty of the College of Musical Arts and the School of Art. Snøhetta designed the $41 million building, which became the first U.S.-completed project for the architectural firm based out of Oslo, Norway. The State of Ohio and principle donors Frederic and Mary Wolfe funded the project. Katerina Ray, a professor and the director of BGSU’s School of Art, along with other professors in the arts, helped select the building’s architects. The rocks in Ohio’s landscape, left by glaciers from the last Ice Age, inspired the building’s designers, Ray said. That is why the building looks like an object emerging from the ground, she said. Ray said that there are benefits about the building holding spaces for the art and theatre departments. The Wolfe Center includes labs to teach professional skills such as digital animation, digital imaging and graphic design. Additionally, it has a choral rehearsal room, two theaters, a costume workshop and a set design space. Ray spoke about the opportunity for students training on the state-of-the-art equipment. “BG really did the right thing,” Ray said. Because of this, students should be able to find a job anywhere in the U.S. and beyond, she said. Ron Shields, the chair of BGSU’s Theatre and Film Department, gave a tour of the Wolfe Center to journalism students in late January. “It had to be a good teaching space. It had to be a good theater space,” said Shields as the students listened to his commentary in the main lobby. The Wolfe Center was designated the second-most important cultural arts building in America, Shields said. Shields showed the students the building’s two theaters during the tour. The Thomas B. and Kathleen M. Donnell Theatre can seat around 400 people. And, it is the most expensive room in the Wolfe Center, said Ryan Miller, the building’s design and product manager. The Donnell has orchestra lifts that can add an additional four rows of seating. Donors can also have their names engraved in the seats. The Eva Marie Saint Theatre, named after the famous BGSU alumna, can hold 120 people. It has movable seating to accommodate multiple seating arrangements. 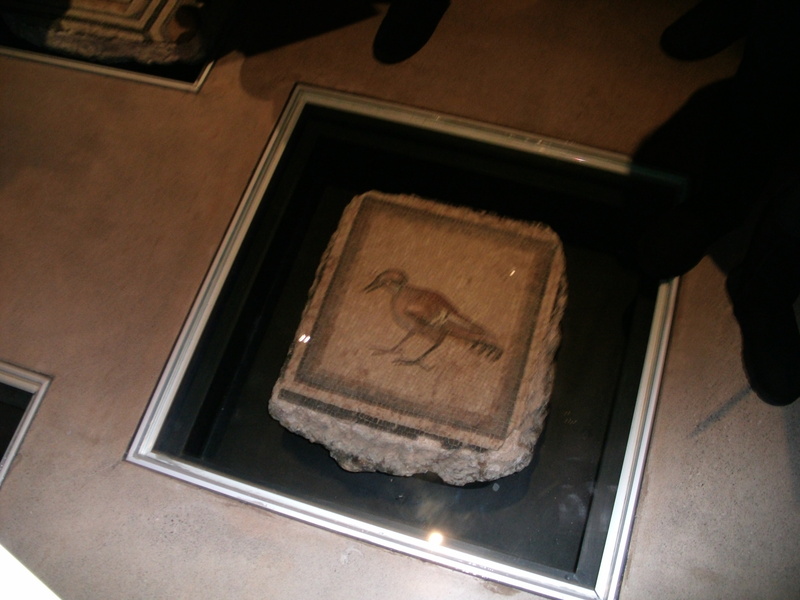 The floor of its lobby holds eleven ancient mosaics displayed under glass, one of them featuring the face of the Greek god Bacchus. This is one of the mosaics in the lobby of the Eva Marie Saint Theatre. Photo taken by Phil Martin. 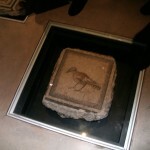 “Arabian Nights” will be the first public show in the Eva Marie Saint Theatre on Feb. 16 at 8 p.m.
A symposium will take place on March 30, beginning at 1 p.m. at the Wolfe Center where experts will speak about the 2,000-year old mosaics. Other events taking place the same day, including a gala concert and a free showing of the opera of “Hercules”, will bring the departments of music, creative writing, theatre and art together, Ray said. The Donnell Theatre will also host “Chicago” the musical in April. More events will take place later this year after the six-month “punch list” period ends, which allows time for equipment in a new building to work properly, Ray said. Olivia Margraf, 22, and Henry Wilkes, 19, both majors in digital arts, had different ideas for the Wolfe Center’s distinct shape. Margraf, a senior, jokingly said she always thought the university wanted to give itself more land by allowing the slant in the building’s back. Wilkes, a freshman from Chardon, Ohio, said he thought the designers did it to be creative. Wilkes also said he thought the building looked really expensive. However, Margraf and Wilkes said they had a problem with the building – and it was nothing structural. “I’d like to see more personality,” Wilkes said. The walls are too white; it would be better to see to see student artwork put up, Wilkes said. Margraf and Wilkes said they didn’t really feel the interaction around the building, especially in the lounge for art and theatre majors. “Interaction takes time,” Ray said. She said everyone’s still getting used to the building. This entry was posted on Wednesday, February 1st, 2012 at 4:57 pm	and is filed under BGSU, Donnell Theatre, Spring 2012, Student Contributor, Wolfe Center. You can follow any responses to this entry through the RSS 2.0 feed. Both comments and pings are currently closed.